I have been using Certbot for all of my SSL certificates so far. Unfortunately, I can’t make the Nginx configuration for Seafile work. I would really appreciate if somebody could help me with the edits I need to make to my Nginx configuration. 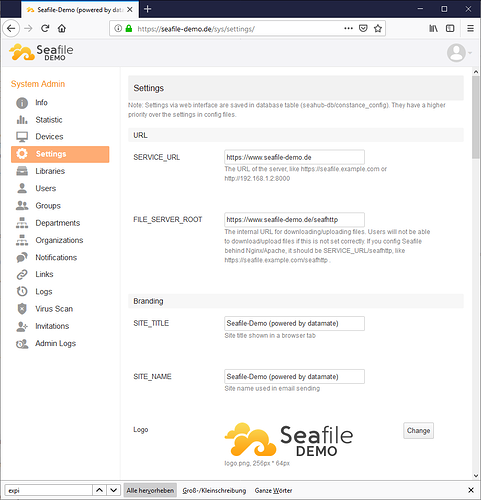 Have a look at the manual: https://manual.seafile.com/deploy/https_with_nginx.html You find more info on what the config should look like. No, it’s not on purpose. Certbot added these lines. Since listen 443 ssl; is mentioned in the next line, I would assume Nginx listens to IPv6 and IPv4? I adjusted my config file according to the manual (using my old Certbot certificate if that matters), but it’s still not working. Whenever I try to make an upload, I get a network error. Whenever I try to make an upload, I get a network error. Only when uploading? The browser shows the green lock? Please check your ccnet.conf, your seafile.conf and your seahub_settings.py. Did you add the “s” to “http” in the ccnet.conf and the seahub_settings.py? Did you add the line “host = 127.0.0.1” in the seafile.conf? No worries at all! I really appreciate your help. Yes, SSL is enabled and the green lock is present. Whenever I upload or download sth. in my browser (haven’t tried the client yet) I get a network error. Also do I need to open any firewall ports besides 443 and 80 if using Nginx? Is the port needed if I’m using Nginx? I tried it with or without it. Neither works. If the website works and shows https but you have troubles when you upload, the problem could be the database. Maybe seafile doesn’t have the permission to write on sql? Post the error you face. The error is just “upload failed - network error”. The seahub.log file lists one error. However, I have restarted seafile.sh and seahub.sh multiple times since the error occured without triggering another Traceback Error (according to the log). I can’t identify any abnormalities in the other log files. I had issues with preparing MySQL initially (the Seafile MySQL script couldn’t access the database) and had to follow the instructions of user mulmer to make it work. Your problem is not an Let’s Encrypt problem. You did not do the changes necessary in Seafile’s conf files. Is this your entire seahub_settings.py? No variable for FILE_SERVER_ROOT? The seafile manual explicity states that with SSL, you need to add a line for host. Please have a look at this site: https://manual.seafile.com/deploy/https_with_nginx.html Scroll down and make the necessary changes. Thank you! I just applied the changes. We have made some progress because the progress bar actually shows up now when I try to upload a file. Unfortunately, I still get a network error shortly afterward. I tried it with and without specifying the port (like described in the manual). Restart both Seafile and Seahub after applying the changes. Thanks! Unfortunately, it doesn’t make a difference. These values take precedence over parameters in the conf files. Additionally, are you sure the SERVICE_URL in ccnet.conf is correct? Shouldn’t it be “https://cloud.domain.com” instead of “https://www.cloud.domain.com”? If these two things don’t help, I am out of ideas. Its’ working now! Your suggestion made me look at the different URLs and when I checked the admin panel I noticed that FILE_SERVER_ROOT was https://cloud.domain.com/seafhttp, while SERVICE_URL was https://www.cloud.domain.com. Adding www to FILE_SERVER_ROOT did the trick. I wonder why it doesn’t work without the www. Probably because I added www.cloud.domain.com to my Ngnix configuration under server_name? Edit: Just noticed that the way I setup my A-records is probably the reason I need the www in the URL. https://cloud.domain.com is currently forwarded to https://www.cloud.domain.com, while it should probably be the other way around, and Seafile might not be able to handle that.